A film crew from BBC Scotland and presenter JB, were at Ripple Farm in January, to film an episode of the CeeBeebies program 'Down on the Farm'. 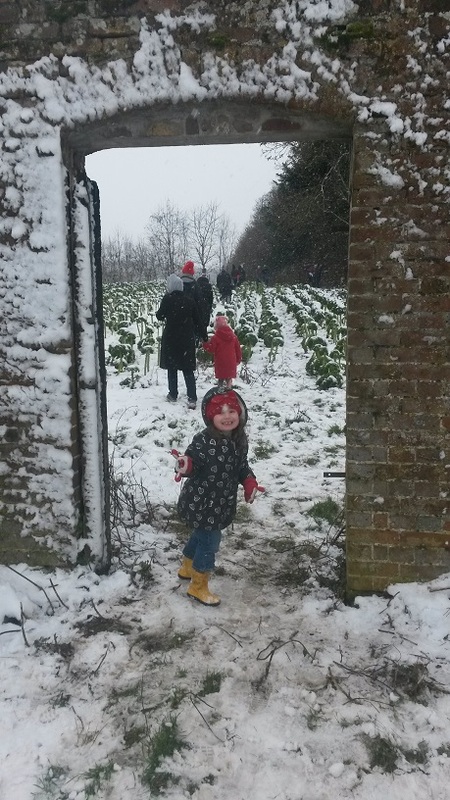 The filming took place at the Victorian walled garden we rent, which looked very picturesque, after overnight snow on the Thursday. Children from Lady Joanna Thornhill School, Wye and the Beacon school, Folkestone took part, and were real stars considering it was snowing again and bitterley cold in the wind. The episode focuses on kale, and the children were involved in harvesting and bunching the kale, and some were happy to taste it raw too! Presenter JB lives in Kent, and also filmed an episode at Nash Nursery, Ash near Canterbury earlier in the week. This is where we get the eggs from to supply our box scheme customers, and we're looking forward to seeing the hens on film!